Chola forces continued with their expedition and moved towards the south of peninsular Malaysia and captured Maayirudingam surrounded by deep sea. They destroyed the blackstone (granite) fortress named Klenggiu (GlangGui in the corrupted form) of the great city Lenggui near the upper reaches of the Johor river,. When the king Chulin of Mayirudingam heard of the approach of the Chola forces under Raja Cholan he gathered all his forces and advanced forward and after ten miles encountered the Chola forces. The king Chulin who came on his elephant charged on Chola forces. The king Raja Cholan too fought from his elephant. However in the bitter battle king Chulin met his death by arrow from Raja Cholan. The forces of Chulin with his fall broke and fled. The Chola forces then entered the fortress of GlangGui sacked it and collected much treasures of this kingdom. Rajendra Chola -1's grandson was offered the daughter Puteri Onangki (Onang Kiu) of the king Chulin of Maayirudingam whom he married. Subsequently this unit of forces returned to Kadarem by sea to join the other two units of the Chola forces. From the Rajendra Chola's Meikeerththi refers as aal kadal ahal sool Maa-Yirudingamum meaning great Maayirudingam surrounded by deep wide sea. Further the 16th century Malay historical Chronicle states Rajendra Cholas forces "....when the men of Ganga Nagara (capital of city of Kadaarem covering the present Kedah and Perak states) saw that their Raja was dead they broke and fled. After the fall of Ganga Nagara Raja Shulan went forward again until in due course he reached the frontier of Lenggui.....". Hence it is clear after conquer of Kadarem kingdom, Chola Forces moved southward and attacked the "great kingdom" of Yirudingam which is undoubtedly the present Johor State which is surrounded on all three sides by deep wide sea. The third unit of Chola forces reached Thalai-Thakkolam (Takua-pa) approximately covering the present Krabi, Phangnga and Surat Thani states of upper south Thailand. The joint forces on their return to Chola country reached the country of Rammanadesa (known as Arumanam in Tamil) the present Pegu region in southern Miyanmar (former Burma), and captured it's sea-port city of Ma-Pappalam (the present Dagon or Rangoon) of Miyanmar. They captured the great seaport city of Ma-Pappalam and the interior capital city Sudammavathi (Thaton) with "protected fortress walls" of the Talaing (Mon) kingdom of Rammanadesa, and defeated it's ruling king Manuha. The Chola forces planted their "Jeyathambam" and returned to Nagapattinam in Tamil Nadu the seaport city of Cholas. King Manuha of Rammanadesa submitted to the Rajendra Chola's forces in this war and agreed to pay tributes. "Swasti Sri Rajendra Cholan Kidaaratharaiyan......"
We note from the Inscriptions of the medieval Chola Kings that from time to time with their victory over certain kingdoms they assumed to themselves the titles expressing their authority over same. Initially we could see during Rajaraja Cholans time as Chola Pandiyan, Chola Keralan etc. Subsequently we note they called themselves as (also) the kings of these kingdoms with their own names prefixed such as Rajendra Cholan Keralan, Kulothunga Chola Kadambarajan also as Kullotunga Chola Kadambaaraiyan. Likewise when Kulothunga Chola too won over Kadaarem assumed the title Kulothunga Chola Kidaarathuaraiyan. This is definitly the title assumed by the king on his own victory over Kadaarem and this title was conferred as honarary titles to the very close and faithfull servent-warriors (Vellaikaarer forces) of the king (who even dared to give their life to the king) to be attached to their own names. We could clearly see this clearly in the Inscription of Rajadhirajadevar - 2 (Inscriptions in Pudukkottai State - Part 1, Inscription No: 139) which states the name of the Vellaikarer who was named as Kulothunga Chola Kidaaraththu Araiyan aana Sadirasan Irasan. Similerly another inscription od Rajadhirajadever - 2 states the name of another warrior as "in naattu Araiyan (Aa)na Rasan aana Kulothunga (Chola) (Ni)riyur Kidaraththariyanen kuduththa.... (Pinnagudi kalvettukal = Avanam Journal. Ithal 23, Article 13 b M. Kayaththridevi. In the year A.D.1028 (in he sixth reign year 'tien-ching' of the Emperor Jen Sung) the Chola Viceroy Sri Deva (Si-li-tieh-hwa) sent an embassy to Chinese court on behalf of Sri Vijaya kingdom lead by Pu Ta-to-lo-hsieh and his deputy Ya-Chia-lu with tributes. The custom was the envoys from distant countries who brought tribute received a girdle adorned with gold and silver. But this time a girdle entirely of gold was given to them, possibly in recognition of the Chola supremacy in South-East Asia during of period by the Chinese Emperor. Again in the year A.D.1033 (in the a second reign year 'ming -tao' of the Emperor Jen Sung) another trade delegation of twenty seven envoy were sent under the Chola ambassador named Pou-ya-toli to China by Rajendra Chola - 1. He carried a letter from Rajendra Chola - 1 written in characters of gold to the Chinese Emperor, and presented him with a dress and a cap ornamented wih pearls, and hundred and five 'leang' pearls and hundred pieces of ivory. This ambassador mentioned that many embassies which left his country to China had faced storms in the sea and have perished along with their goods. He expressed his great desire to advance right up to the front of the imperial throne and perform the ceremony called Sa-tien which was in his view was the greatest way of show his respect to the emperor. The prmission was granted and the ambassador put all the pearls on a silver tray which he raised above his head after kneeling down, and then he spread them at the feet of the Emperor, who provided him with honorary titles. After thirty three years of rule Emperor Rajendra Chola - 1 fell ill towrds the year A.D.1044 while he was in the region Brammadeyam. Is seem with his old age he fell severely ill and the days were nearing to his death. On he realising same he one day called all his very close and trustworthy Ministers to the private chamber at Brammadeyam palace including some of his sons (and some immediate family members). They offered their salutations to the Emperor and took their seats, and the Emperor too in turn honoured them. Therafter he placed his son the Rajendra Chola - 2 (Dhabrasabadhipa meaning "Sittrambalavan" - the name of this prince prior to being anointed as the heir- apparent to Chola throne with the royal title the Rajendra - 2). He embraced him shedding tears and advised the Ministers "this son I love most and he too loves the people of the country" and requested them to offer the same respect that they gave to him also to this son. Thereafter he met his death in this same year A.D.1044. Rajendra Chola - 1 would have been around 79 - years of age at the time of his death. His body was interred at the royal pyre (pallipadai) built at the village Brammadeyam, and one of his queens very close to him named Viramadevi in grief over his death threw herself into the buring pyre and killed herself. In the same year in deep grief over the death of Rajendra Chola - 1 one of his favourite royal consort Anukkiyaar Nakkan Paravai Nangaiyaar too met her death. ".....Once the king Rajendra invited his close and most trust worthy ministers of exemplary character to his private chamber. They took their seats as advised by the king. Thereupon the king kept on his own lap his son Dabhrasabhadhipa (Sittrambalavan) he embraced the son most affectionately and his entire body was abound of joy and shedding tears (of joy) on the head of the so, and as if he was strongly indicating what was in his heart the king told the ministers the following: "you are well aware that this son I love most he also very much loves the people of the country. Therefore please arrange to offer him the same respectful treatment as you were used to do for me". The ministers heard with attention this profound and serious (gambira) statement of the king and kept it well in their hearts. Then prostrating before the king they replied that they would certainly abide by the kings words......"
Copper Plate on Grants to Rajendrachola Iswarem (present Kailasanathar temple) at Thiruvinthalur, Mayiladuthurai, in Tamil Nadu. There is no direct evidence on the age of Rajendra Chola - 1 at the time of his death. However it could be approximately computed as follows. Athiththa Karikala the elder brother died when he was only a Heir Apparent and ruled for five years. If we presume that Athiththa Karikala was 20 years old and as we know he ruled in this capacity for five years it is clear he was 25 years of age at the time of his untimely death. If we assume there was a gap of two years each between Athitha Karikala, his sister Kudavai, and Rajaraja, then we arrive at Rajaraja's age at the time of death of Athitha Karikala to be around 21 years. The next successor to Chola throne after Athiththa Karikala namely Utthama Chola ruled for 15 years. There after Rajaraja ruled for 29 years followed by Rajendra Chola who ruled for 33 years. If we presume Rajaraja Chola married at 18 years then at the time of death of Athitha Karikala, the Rajendra Chola would have been 2 years old. Hence summing up we arrive at the approximate age of Rajendra Chola at the time of his death was 2 + 15 + 29 + 33 = 79 years. 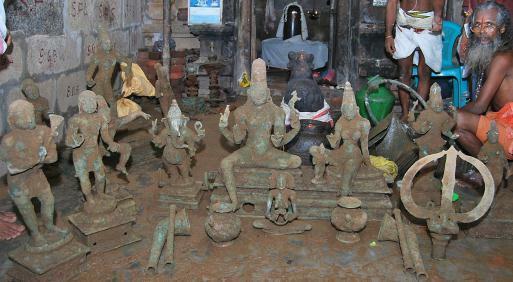 On this same basis Rajaraja Chola would have demised at the age of 65 years. Thereafter the Ministers having understood the indirect request made by Rajendra Chola before his death as that his second son Sittrambalavan to be appointed as the new heir-apparent to Chola throne, requested him to agree for the anointing ceremony with religious rituals. But Sittrambalavan refused to same and requested "first" to call his elder brother Rajathiraja Chola - 1 from Mathurai where he was ruling as the Chola viceroy and who was already the next heir-apparent to Chola throne, and to anoint him as the next Emperor of the Chola empire. This they agreed and thus Rajathiraja Chola - 1 acended the Chola throne as it's next emperor in the year A.D.1044. 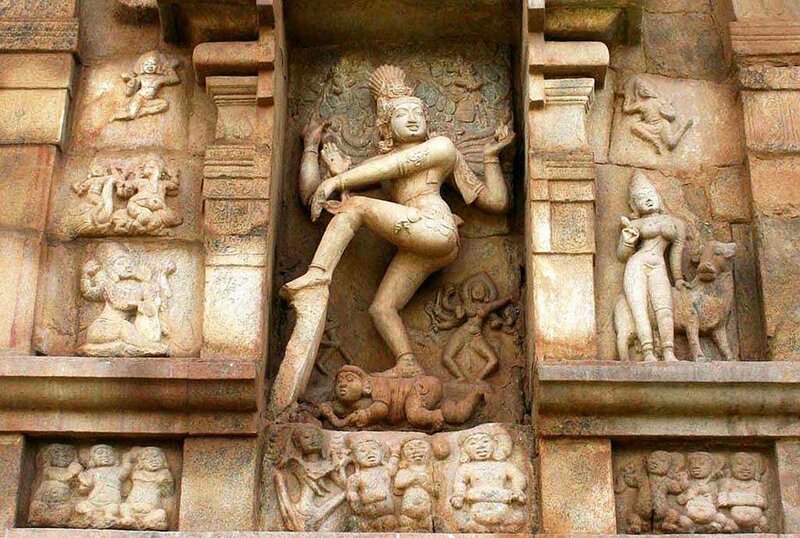 Thus Rajathiraja Chola - 1 inherited the vast Chola empire from his father Rajendra chola - 1, having it's extreme outer limits at Mahodai (the present Kodungallur) in Kerala in the West, the Gangetic region in the North, the Ilankai (Sri Lanka) in the South, and Karadarem (in the present Kedah State in Malaysia) in the (far) East (overseas). He immediately therafter appointed his young brother Sittrambalavan as the new heir-apparent to the Chola throne as per the wish of his father before his death with the royal title Rajendra Chola - 2, and also made him the Chola viceroy of Paandiya Nadu and made him rule over that Paandiyan kingdom. ".....Immediately after recording the king's vague disclosure of his wish, the ministers in acceptance of same.....fully realised his desire. But the land and the people herein were drowned in sorrow. Thereupon being attracted by the virtues of the son (Dabhrasabhapati) and obeying the words of the father (Rajendra - 1) the ministers approached the son and reminded him that 'the king ordered you for the kingdom as heir-apparaent'. So saying the ministers requested the prince to act as per the order of the father who was to be obeyed by the son and by ministers. The added the anointing of the prince (as heir-apparent), must be conducted immediately since the kingdom couldnot afford to remain without a king and all the preparations had been made ready for the formal religious function of the act. But the son magananimously and very politiely told them that 'the elder son alone should succeed the father. Now you all should bring the first son and perform the coronation since he alone is the master of me and of you all and of the whole earth......"
Kovi Rasakesari panmaraana Udaiyaar Sri Rajathirasa thevarkku aandu 26 vathu...."
Inscription on a stone near Madeswara temple at Mandikere in Nelamangala Taluk, Karnataka State. With the the death of the Queen Viramathevi (in the year) her own brother named Mathuranthahan alias Parakesari Velar who served under Rajendra Chola - 1 as his Military General (Senaapathi) arranged Water Shed (Thanneer Panthal) to quench the thirst of the soul of his sister at Brammapuriswarem Siva temple at Bramadeyam (19 km from the present Vilupuram of Tamil Nadu). Rajathiraja Chola - 1 too arranged through Perunguri mahasaba of Gandarathiththa Chathurvedimangalam for a festival to the merit of his father "Chakkaravarththi Rajendra Chola - 1" on the day of his birth natchathiram being the Adi Thiruvathirai day, at the Thirumalapaadi temple in Thirutchirappalli district, Tamil Nadu. With the death of Rajendra Chola - 1 his son Rajathiraja Chola - 1 in the year A.D.1045 [u]installed the bronze images of Rajendra Chola - 1 and his "Anukkiyaar Nakkan Paravai Nangaiyaar" at the Thiyagarajar temple at Thiruvaarur, (to which they two were much devoted), and arranged for the poosai offerings and neivethiyam for these two images regulerly, from the funds from the very same lands donated as endowments by them earlier to this same temple when they were alive. At Thiribhuvani in the village Thaniyur (in present Pondicherry) a mandapam was built at this temple by Sembiyan Umbala Naattu Muvenda Velaan to the merit of the soul of Rajendra Chola - 1. Subsequently in the year A.D.1048 the military general (Senapathi) of Rajathi Raja Chola -1 named Rajendra Chola Maavalivanarajar provided 72 veli (a land measure) lands yielding 12000 kalams of paddy per year for offerings in the name of Rajendra Chola from this same mandapam to celebrate festivals at this temple. Arrangement were made also for reciting Tamil "Thiruvaaimoli" (of Naalaayira Thivya Pirapandam) at this Vaisnavite temple. bramman paathaththu theravum sivalokaththukku eluntharulina Nampirattiyaar Viramahatheviyaarkku Sri mathahathhu (maha thaahaththukku) ivarudan pirantha Senaathipathikal Mathuraanthahan aana Parakesari Velar vaiththa thanneer panthal......"
"......The Perunguri mahasabaa of Gandaraathiththa Chathurvedimangalam to dispose of some taxes and institute a festival on "nanmai udaiya Chakravarththi Sri Rajendra Choladevar tirunakshaththiram......"
Inscription on the Thirumalapaadi temple at Thirutchiraappalli district, Tamil Nadu. ".......Udaiyar Sri Rajathirajathever in his 27th year Shythiriya Sikamanivalanaattu Thiruvarur kootraththu Thiruvarur periya koyil pathipala moolaththaaridai Udaiyar Sri Rajendra Chola Devar, Annukkiyaar Nakkan Paravai Nangaiyaar ikk koyil thevathanam Theepamkudiyil .....nilaththille Udaiyaar Sri Rajenthira thevarkkum Paravai Naachchiyaarkkum thiruamuthu.....thiruamuthkku venduvanavaittrikku.....thiru araneriyudaiyaarai thirua araathinai seikintra Brahmanan oruvanukku(m).....(nellu koduththu)......Udaiyaar Sri Rajendra Chola Thevarkkum Paravai nangaiyaarkkum thiruamuthukku mattakaalaal adaiththa nellu nootru irupathin kalam kondu nivantham seiyum padi (uthaavi idappattathu)......"
Inscription on the north and west walls of the Karuvarai of Thiyagarajaswamy temple at Thiruvarur, Tamil Nadu. "......Land for offering in the name of Rajendra Chola by senapathi Rajendra Chola Mavalivanarajar under auspicious of the great assemby of the village at Thaniyur which met in the mandapam built by Sembiyan Umbalanattu Muvenda Velan for the merit of Rajendra. 72 veli land yielding 12000 kalam of paddy per annum of which 2475 kalam went for festivals (specified), feeding Vaisnavas and reciting the Thiruvaimoli, the balace going to the maintenance of an elaborately organised college of higher learning. Conditions laid down regarding the taxation of this land. Exemptions for teachers and students......"
The Tamil Chola Emperor the Rajendra Chola - 1 (A.D.1011-1044) was the "greatest Emperor of India" who not only captured many countries covering three quarter of then India and the near overseas countries, but also the first Indian King or Emperor who sent many war ships across the ocean during the medieval period, and captured many countries of South-East Asia and brought them under the Chola fold Hence "Rajendra Chola - 1 deserves an "outstanding and premier place" in the 2500 years long recorded history of entire India. Last edited by virarajendra; 15th September 2018 at 01:02 AM. Last edited by virarajendra; 23rd October 2014 at 06:10 PM. Last edited by virarajendra; 6th March 2018 at 10:01 PM.